For years, this was the favourite book of one of my friends. She'd been telling me for ages to read it, and apparently thought I wasn't doing that fast enough because one day, she just delivered it in the mail to me, so I didn't have an excuse any more and could read it immediately. And even though it has been years since I read it, I've always found it a special book. 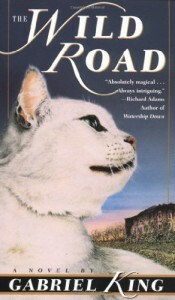 It was the first real book with animals as main characters and animal POVs that I read, and it took a while to fully realize that it was done very good in the book. The cats really act like cats most of the time, and are not just furry, four-legged humans. The story and the writing were nice as well, and even though I've never managed to read the sequel, I look back to reading The Wild Road with pleasure.